As I mentioned yesterday, I’m off in London for a couple of days so posting new content and riding is a bit more difficult. Still, I’ll try and do my best. No riding today, but here’s something I wrote earlier as part of a series featuring bike-friendly businesses in Manchester. Earlier this week, I met a colleague at Takk, one of the (relatively) new cafes on Tariff Street at the edge of the northern quarter. Always nice making a trip across the Pennines. Finally got to check out @takkmcr. Really excellent coffee. Takk is an Icelandic themed cafe occupying a space in what I think was formerly a fashion warehouse or outlet. It prides itself on the fantastic selection of coffee on offer, including: espresso-based drinks; good filter coffee and also Aeropress. They also offer cakes, some pastries (which are gone by 10 am) and freshly-made sandwiches at lunchtime, made on bread baked down the road at Barbakan. I’ve been into Takk a few different times during the day. It’s a great place to grab a cup of coffee and do a bit of work, or just meet people who might be stopping by: think of a common room, particularly for creative and digital types, which explains the number of Mac users. Takk happily caters for them: there’s decent wifi, ample power sockets located around the room and the mix of individual and communal tables is ideal for having some quiet thinking time or getting a group together to flesh out some ideas. They also do a stunning Brie, apple and jelly sandwich. Takk is notably bike-friendly: whenever I’ve been in, there have been a few bikes stacked up nearly beside the coffee counter. It’s a warm welcome to riders, if ever there was one. It helps that many of the staff cycle into work too. Unfortunately, there’s no official bike parking outside and a neighbouring local grinch business wasn’t too happy with cyclists locking up against their railings opposite. Takk gracefully responded by inviting anyone who cycled there to bring their bike indoors. This isn’t a problem unique to Takk: Tariff Street is one of these new bits of Manchester that has yet to benefit from bike parking. Hopefully, we’ll see bike racks appear nearby very soon. It’s something that I raised at the nascent NQ Forum. I’m looking forward to returning to Takk soon. I still think about that sandwich. But if you can’t be a regular, they do offer roasted coffee ready to take away so you can try and recreate it at home. Just make sure you have an array of Mac laptops to complete the experience. I had a really positive response to yesterday’s blog post, particularly the link to the London Cyclist blog. Yep, I know I’m in Manchester but many of the learnings collected there can be equally applied wherever you are. There are, of course, plenty of great bike blogs in Manchester and I hope to bring you highlights from some of those over the coming days. One of my favourites is Manchester Cycle Chic, which shows off cycle style in Manchester. It’s a great way to show that you don’t always need to be kitted out in Lycra or body armour to get around on the bike. This afternoon saw a huge celebration as UMBUG (University of Manchester Bike User Group) hit 1,000 members. With almost 40,000 students and 3,900 academics, it’s not surprising that a significant number are bike users and have signed up to the BUG, making it the biggest in the UK. UMBUG celebrated this milestone with a mass photograph of members and, most excitingly, the debut performance of the Spokes bicycle dance troupe! The Spokes are the UK’s first – and only! 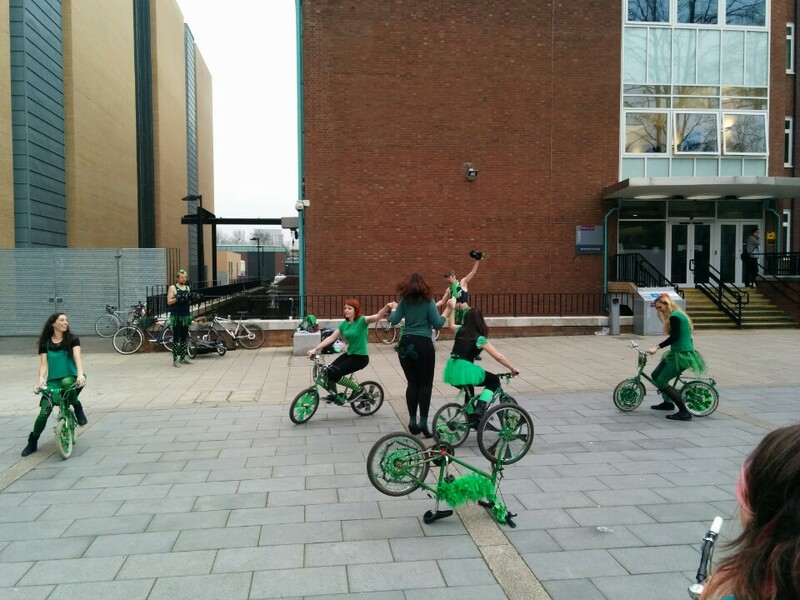 – bicycle dance troupe, sharing the joy of cycling through the medium of dance. It was described as their debut performance as all the members, except Kat, had joined only a few months ago. Even more amazingly, they’d only started to rehearse eight weeks earlier! So it was a pretty big moment to go out in front of the gathered UMBUG crowd. Sadly the photos do little justice to the energy and enthusiasm put in by the Spokes, even in the face of the sound system not quite working. That didn’t dull the excitement as the crowd joined in by humming – first the Blue Danube waltz by Strauss which then broke into Beyoncé’s Single Ladies. Let’s hope the video goes up soon. The UMBUG event was pretty good, with TfGM also in attendance freely handing out badges, puncture repair kits and optional hi-vis jackets. Tea and coffee was also available and Dave from mobile bike repair service Revolve MCR was doing on-site maintenance. It was good to see him out despite recent reports of a break in. The day was rounded off with a quiet drink and catch-up with my former colleague and bike buddy Gabrielle. We reflected on the sad news this morning that a fellow rider lost their life in London. Something I don’t really want to dwell on, but the truth is, cycling and heavy goods vehicles really don’t mix. If you want something more in-depth about cycling and relatively safety, this is a good blog post about how it compares. Finally, over the next few days, I’ll be on holiday in London so it’s unlikely I’ll be able to post much. Nonetheless, I’ll try and keep up the tweeting and, at least, use those to form the basis of some new content. I’m also really interested to hear what you think I should write about. Feel free to drop me a comment below. After yesterday’s sunshine, the weather in Manchester was back on form – looming grey clouds and an unhelpful wind that buffeted me unexpectedly when I rode out to work. Again, I’d failed to leave early for the fabled ‘long ride in the morning’, but I will get around to that very soon. One of the things I noticed on my ride to work this morning is that there’s a road safety campaign in full swing. I’ve seen it on the back of buses, reminding drivers to check for cyclists and junctions. And on Sackville Street there’s a prominent poster suggesting cyclists ride central on narrow streets (“…like this one”, I thought in my head as I went past). Riding in “the primary position“, or “taking the lane” is something I’d first learned about from this brilliant blog post from London Cyclist: 7 mistakes you’re making with your cycling and how to correct them. I actually first started commuting properly by bike in London back in 2010 when I was seconded to another department, shortly after I bought my first bike as an adult. Andreas’s post was a great way to avoid some basic mistales that I might’ve made, starting out commuting on London’s busy roads. I recommend even experienced cyclists take a look and check they’re not making any obvious errors out of habit. But equally importantly in this campaign is educating drivers about why cyclists might not be riding in the gutter or using the marked bike lane. As anyone who rides regularly will tell you, there are a few drivers who still refuse to accept that anyone with fewer than four wheels is allowed to use the road. Hopefully, this government-backed intitiative will remind everyone to look out for one another and explain some sensible cycling techniques. This evening, I cycled home more laden than when I arrived. I had to take home some components for a new PC that I’m building, including two hard drives and a motherboard. You might think that delicate components like hard drives should probably be transported by courier or, at least, Royal Mail. I decided to wrap the two full-size drives in bubblewrap and shove them in a small parcel box I had spare from an eBay delivery. I’m happy to report they made it home fine, snugly fitting in my pannier alongside the motherboard box and my laptop. I suspect, to be honest, that they probably got the same amount of bouncing around as they would do in the back of a Royal Mail van, but they are designed to be transported and cycling is a perfectly acceptable way of doing so. Last April, I began seeing tweets tagged with #30daysofbiking appear in my timeline. It turned out 30 Days of Biking is a campaign founded in Minneapolis that seeks to share and promote the joy of cycling. Now in its fifth year, #30daysofbiking has become an international month-long celebration of cycling culture wherever there are tweeters and riders. Being a regular cyclist in Manchester, I joined in with a few tweets last year to share my daily riding experience. I didn’t keep it up too closely, though I did cycle most days as it’s how I get to work or to the shops. This year though, I’m going to go one step further by pledging to cycle daily from 1 April. I’ll also be trying to write a related blog post, either of the ride, or maybe a review or advice: anything, really that helps me share why I genuinely love going out on my bike. 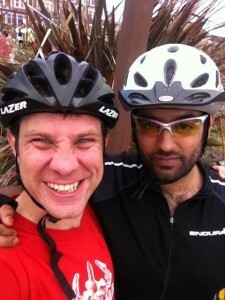 I’m doing this because I believe that cycling is an amazingly positive and liberating activity. It requires very little fitness to get going, is generally considered low-impact on your body and can show benefits quickly. And perhaps surprisingly, Manchester is a city that’s well suited to cycling: it’s generally flat (at least in central and south Manchester), has access to some particularly stunning bike routes and also has a number of groups that are actively passionate about getting people riding. You don’t need a fancy bike either. I love to geek out about bike frames, components and accessories, but the truth is, almost any old bike will do. Just make sure it’s roadworthy – your local bike shop can help you with that. Sounds good? Want to read more? Check out 30 reasons to take up cycling. And once you’ve done that, go and rummage around your garage, dig out that dusty old two-wheeler and take it for a spin. For more advice on getting cycling for fitness, check out the NHS choices website.